Shows and appearances may be tailored to suit the client, but after many years in the business, Harry Kazzam knows that some formats work well, while others don't, so call for advice on the best way to run your event. Party Shows include games for which prizes are provided. In a birthday party situation all the children receive a balloon hat and a party bag. There is music and dancing throughout the party and everybody has a great time. Harry Kazzam offers a party service which is fantastic value for money where the client only needs to provide children and food (and a venue of course) and they can sit back and relax while Harry Kazzam does everything else. 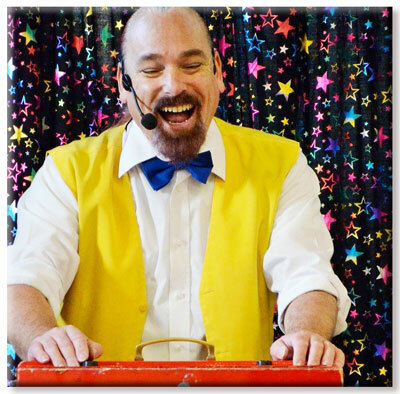 Harry Kazzam is available for Birthdays, Weddings, Christenings, fully parties or stand alone magic shows, Schools, Clubs, Fetes, Fairs, Fundraisers, Holiday Camps, Hotels, in fact, any situation where a professional entertainer is required. Harry has worked in front of audiences large (approx 4500) and small (just 4 children), so whatever your needs, Harry Kazzam is your man. © Harry Kazzam Entertainer 2014. All rights reserved.